This is awesome! Love the dp and the ribbon! You rock GF! Oh beautiful, I love the colors, thanks for playing at GS! What a pretty card and two challenges at once! Very pretty! I love the coloring and the colors! LOVE your paper choices! That teapot with flowers is beautiful! 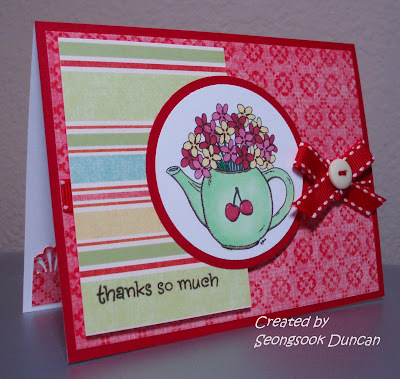 such a sweet card...I love the pink/red combo! Great card love the colors! What a cute card!! I love the green with the red! So pretty! I love the colors you colored the flowers!